Welcome to The Ultimate Hostess Holiday Gift Guide – where everything is under $40! It’s fun to be invited to a Holiday party and it’s even more fun to arrive at that party with a gift in hand. 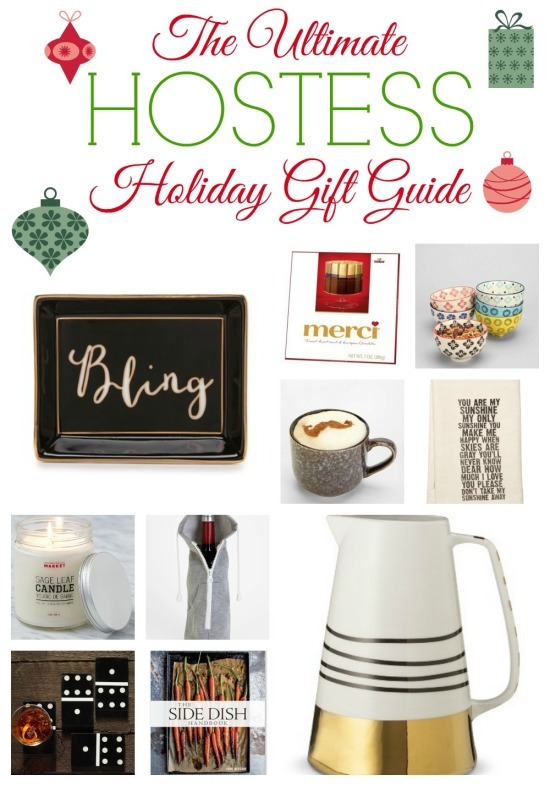 Since the season for entertaining is here, I thought I would help you out with some gift ideas for the Hostess. Whether she likes to cook, loves to drink coffee and/or wine or decorate her home, you’ll find a gift idea *under $40 for her. 1. C. Wonder Trinket Trays – I instantly fell in love with the Bling tray. It’s the perfect size for displaying smaller items. They also have trays that say Gems, Trinkets, Adore and Stuff. 2. merci European Chocolates – For 40 years, merci has been a best-selling chocolate in Europe and is now available in the United States. Sweet! (Literally) These chocolates feature gorgeous Holiday packaging and are so incredibly affordable you’ll buy some for the hostess and yourself. Available at Target, Walmart, Costplus World Market, CVS, Walgreens, Krogers and Aldi. 3. Floral Treat Bowls Set – This set of 6 treat bowls is perfect for the hostess who loves some pattern and color in her life and likes treats! Comes in a set of 6. 4. Coffee Stencil Set – This is for the hostess who likes to go the extra mile. The hostess who loves coffee and likes to get a little artsy with it. The set includes stencils for a mustache, deer and heart. 5. You Are My Sunshine Tea Towel – What’s better than a tea towel made out of organic flour sacks? A tea towel with a great saying on it. 6. Common Good Scented Candle – This candle smells soy good. (Soy.You get it?) It’s made with soy wax, essential oils and has a cotton wick. What about the smell? It has a light, invigorating white grapefruit fragrance which is perfect for refreshing the air. 7. Zip It Up Wine Bottle Hoodie – Does it get much cuter than this? Now your hostess can keep her wine cozy with its own zip up hoodie. 8. Set of 4 Domino Coasters – Help your hostess protect their surfaces from water rings in a fun and strategic way. 9. Williams-Sonoma Side Dishes Cookbook – This exclusive cookbook features over 40 recipes and tips using your favorite ingredients and will help your hostess create amazing side dishes. 10. Oh Joy! Striped Stonewear Pitcher – The Oh Joy! for Target line is not only affordable, but it’s just fun. This pitcher is pretty enough to use for a party, but practical enough to use everyday as well. 11. Wine Pourer & Stopper Set – This set puts a stop to messy pours and helps keep the wine fresh as well. 12. S/6 Letterpress Note Cards – These notecards are handcrafted and printed on recycled cotton paper. They’re perfect for any occasion and have several designs to choose from. 13. 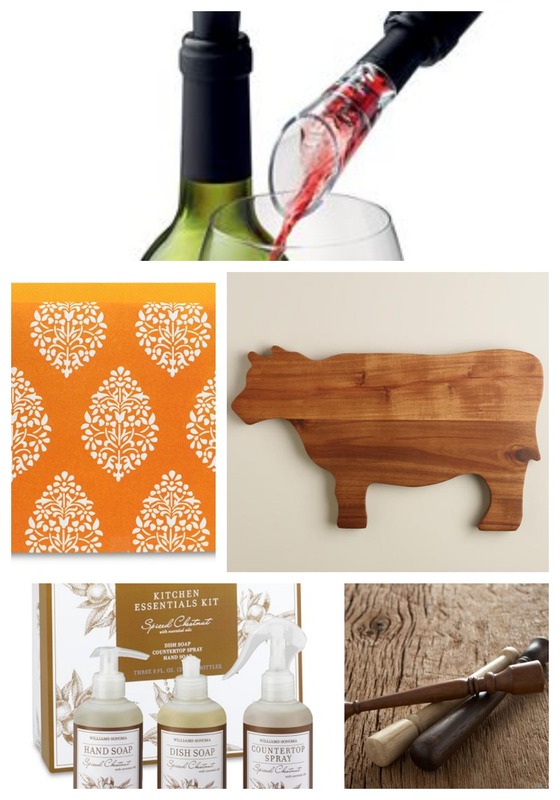 Cow Cutting Board – Because every hostess needs a cow cutting board. They just don’t know it yet. It’s crafted of acacia wood and is just downright adorable. 14. Williams-Sonoma Kitchen Essentials Kit, Spiced Chestnut – Chestnuts roasting on an open fire….It’s a familiar tune and a scent that reminds us of the Holidays. This set includes 8 oz. each of their Hand Soap, Dish Soap and Countertop Spray – all in the warm, buttery fragrance of chestnut essence, spiced up with aromatic cinnamon and clove. 15. Pottery Barn Muddler – Gift your hostess with a wood muddler, which is perfect for certain cocktails. Plus, it just looks awesome.